It’s been a while since we’ve caught up with adventurous Irish Beasties Paddy and Plunkett… but that doesn’t mean they haven’t been busy! A while ago, they sent me some pictures of their visit to the National Maritime Museum of Ireland, which is in Dun Laoghaire in south County Dublin. I can see why they were keen to have a look around… the place is full of Beastie-sized boats! 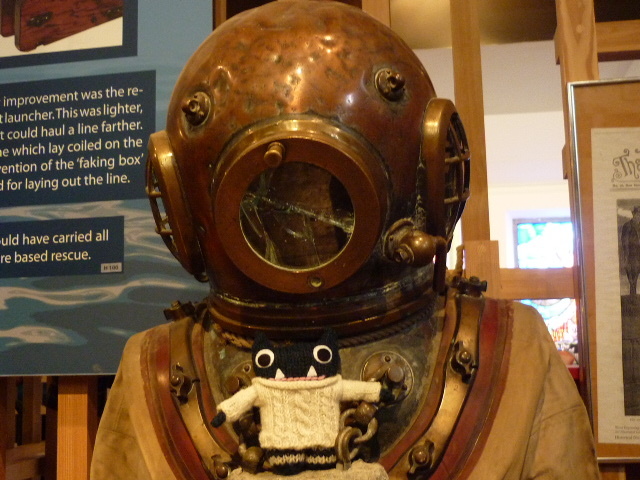 Of course, not everything in the museum is miniaturised! Here they are posing with a recently restored Boyne curragh – a traditional Irish river boat made from cow hide stretched over a framework of woven hazel. And this giant lightbulb definitely isn’t Beastie-size! It’s the revolving lamp from a lighthouse, and its bright light sent the boys scuttling off in search of their sunglasses. But look what they found on the way! 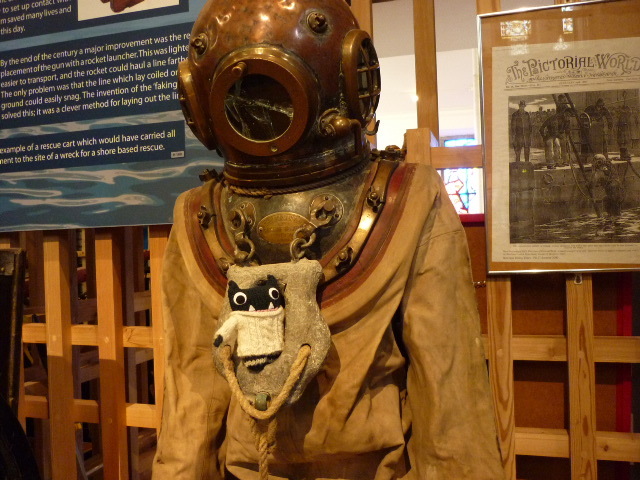 Paddy couldn’t pass up the chance to pose with this old-fashioned diving suit. … And Paddy sent it using the Morse code machine! Luckily they chose to email it to me as well… my knowledge of Morse code is a little rusty. And once the message was sent, it was time to head off – who knows where they’ll pop up next? Paddy and Plunkett are are special sub-species of Beastie called “Barróg Beasties”. “Barróg” is the Irish word for “hug”, which neatly sums up how friendly these little monsters are! They’re also special because they’re made from 100% Irish wool, which is spun and dyed in a family-owned mill in Co. Kilkenny. Keep an eye out for more Barróg Beasties on the BeastieBlog in the not-too-distant future! Previous Post Fighting Fire With… Fibres! Woolly Fibres! Thanks for visiting, and for your comment 🙂 I’ve just spent an enjoyable few minutes having a look around your blog… You have some great projects!